A key component of risk reduction is reducing the potential consequences that could result from toxic or flammable releases. The science of vapor cloud dispersion has advanced significantly in recent years, but one of the long–standing challenges has been in accounting for dispersion around buildings, equipment, and similarly sized geologic and man–made features. 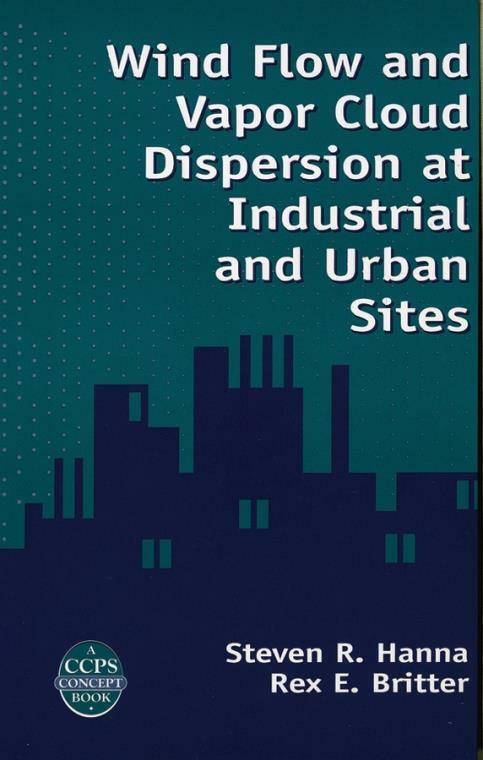 With current concerns about terrorism in industrial and urban sites, improving consequence modeling within industrial and urban sites is more important than ever This new definitive book advances the science of vapor cloud dispersion by: - Describing how structures at an urban or industrial site affect dispersion, and how these effects should be treated in consequence models - Explaining surface roughness length (z0) and displacement length (d) so that they are clarified for readers with minimal meteorological background - Presenting criteria for when the structures should be considered broadly as roughness elements, or when they should be considered from the viewpoint of their wake effects - Defining conditions for which different models apply and providing continuous solutions for transitions between flow regimes. - Providing the appropriate roughness inputs to transport and dispersion models depending on conditions. - Demonstrating the application of these techniques through worked examples. 1.2 Objectives of This Book. 1.4 Definition of Scenarios and Modeling Scales. 2. Overview of Meteorology and Atmospheric Dispersion. 2.1 Definitions of Concepts and Terms. 2.3 Surveys of Currently Available Methods for Classifying Dispersion Coefficients for a Variety of Surface Types. 2.3.1 Introduction to Discussion of Effects of Surface Features. 2.3.2 Use of Simple Gaussian Dispersion Model to Understand the Effects of Roughness. 2.3.3 Situations Where Winds, Stability and Underlying Terrain Vary in Time and/or Space. 2.3.4 Methods for Accounting for Surface Roughness Length and Displacement Length in Dispersion Models. 2.4 Survey of Experiments Showing Effects or Surface Roughness Obstacles on Dispersion. 2.4.1 Dispersion of Clouds with Mass–Weighted Mean Heights Greater Than the Roughness Obstacle Height, Hr. 2.4.2 Dispersion of Clouds with Mass–Weighted Mean Heights Less Than the Roughness Obstacle Height, Hr. 3. Methods for Characterizing the Effects of Surface Roughness Obstacles on Flow. 3.1 Required Flow Characteristics for Input to Transport and Dispersion Models. 3.2 Consideration of Flow Above and Below the Tops of the Obstacles. 3.3 Flow above the Surface Roughness Obstacles. 3.3.1Definition of Surface Roughness Length zo, and Displacement Length, d, as They Relate to Flow Characteristics Such as Wind Speed. 3.3.2 Methods for Estimating zo and d from Wind Observations. 3.3.3 Size of Surface Area that Influences Flow at a Given Height. 3.3.4 Estimation of zo and d Based on Knowledge of Surface Roughness Obstacles Dimensions and Geometric Relations (the Morphological Method). 3.3.5 Overview of Land Use Category Methods for Estimating zo and d.
3.3.6 Estimation of zo for Surface Conditions Varying in Space. 3.4 Flow Through an Obstacle Array. 3.4.1 Extent of the Roughness Sublayer. 3.4.2 Wind Velocity Fields within and Near Obstacle Arrays. 3.4.3 Model Comparison with Experimental Data. 3.4.4 The Turbulence Field within the Obstacle Array. 3.4.5 Extensions to Other Effects within the Obstacle Array. 3.4.6 Summary of Recommendations for Wind Speed and Turbulence within the Obstacle Array. 3.5 Summary of Recommended Methods for Estimating zo, d, and Flow Characteristics Such as Wind Profiles, Friction Velocity (u∗), and Turbulence Velocities in Urban and Industrial Areas. 3.5.2 Determination of zo and d.
3.5.3 General Simple Formulas for u∗, u(z), and Turbulent Velocities. 3.5.4 Selection of an Appropriate Mean Wind Speed and Stability. 3.5.5 Estimates of Urban and Industrial Geometric Parameters Hr, f, and p Using the ROUGH Code. 3.5.6 Range of Uncertainty in Estimates of zo, d, u∗, u(z), and Turbulent Velocities. 4. Integration of Roughness into Dispersion Models. 4.1 Objectives and Fundamental Physical Concepts. 4.2 Dispersion Models for Clouds Extending Above Hr. 4.2.1 Introduction to General Characteristics of Models. 4.2.2 Summary of Dispersion Experiments over Rough Surfaces. 4.2.3 Gaussian Plume and Puff Model. 4.3 Dispersion Models for Clouds below Hr. 4.3.1 The Cloud Velocity, ue oru,sub>avg, below Hr. 4.3.2 The Vertical Plume Dimension z below Hr. 4.3.3 The Lateral Plume Dimension y below Hr. 4.3.4 The Along–Wind Puff Dimension x below Hr. 4.3.5 The Effect of uc, x and y and z on the Concentration at Heights below Hr. 4.3.6 Extension to Positively and Negatively Buoyant Releases below Hr. 4.4 Transition Methods for Clouds of Height Close to Hr within the Urban Roughness Sublayer. 4.5.1 Dispersion Models for Clouds extending above Hr. 4.5.2 Dispersion Models for Clouds Released above or Near Hr. 4.5.3 Dispersion Models for Clouds below Hr. 4.5.4 Dispersion Models for Scenarios Where the Upwind and Downwind Roughness Is Different. 4.5.5 Dispersion Models for Clouds Released Upwind of the Roughness and Traveling into and through the Roughness. 5. Worked Examples of Calculations of Surface Roughness Length for Seven Industrial and Urban Scenarios. 5.1 Case I: Small (18 m by 24 m) Industrial Plant. 5.2 Case 2: A Group of Industrial Warehouses Covering a 250 m by 250 m Area. 5.3 Case 3: Medium–Sized (400 m by 400 m) Refinery. 5.4 Case 4: Typical Urban Area (Chicago). 5.5 Case 5: Industrial Plant (Case 3) in Chicago Urban Area. 5.6 Case 6: Industrial Plant from Case 3 Located on a Peninsula. 5.7 Case 7: Large 4 km by 4 km Refinery in a Desert. 5.8 Summary of Seven Cases Used for Worked Examples. Appendix: Text Files for CD–Rom with zo Estimation Codes.